16th March 2001 saw Mumbai welcome Jagdeep Kapoor's best-selling management guide, 24 Brand Mantras. Chief Guest, Dr.Vasant.N.Patankar, Lupin Professor along with Mr.Jagdeep Kapoor. Launched at a function held at the famous bookstore, Crossword, 24 Brand Mantras was released by Dr. Vasant. N. Patankar (Lupin Professor - Business Philosophy and Strategy, Narsee Monjee Institute of Management Studies, Mumbai). 24 Brand Mantras has been ranked as a bestseller by The Asian Age newspaper and is acclaimed by the likes of industrialists Kumaramangalam Birla and Adi Godrej. Catch the launch of 24 Brand Mantras now in your city as Jagdeep Kapoor will be launching the book at various Crossword bookstores in metropolises across India. 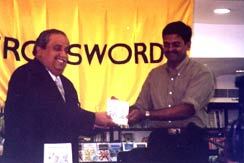 April 21, 2001 - Chennai - Crossword, Book release function at 6:30 p.m.
along with Mr.Jagdeep Kapoor at the launch of 24 Brand Mantras. 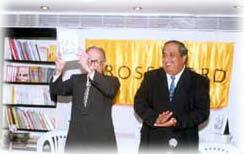 April 22, 2001 - Hyderabad - Crossword, Book release function at 5:00 p.m.
Venue: Crossword Level 4, Shopper's Stop, SP Road, Begumpeth, Hyderabad -16. Contact 7763239 for further details. 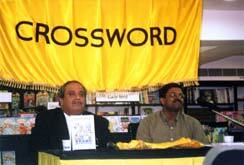 April 29, 2001 - Pune - Crossword, Book release function at 11:30 a.m.